Due to a combination of extra work and a bad back, I haven’t had much time to play with Marty during the week. Saturday was ruled out because my back gave up and I spent what should have been mule time lying on the floor instead, and on Sunday we had a crisis and I was able to appreciate the benefit of previous groundwork sessions first hand. 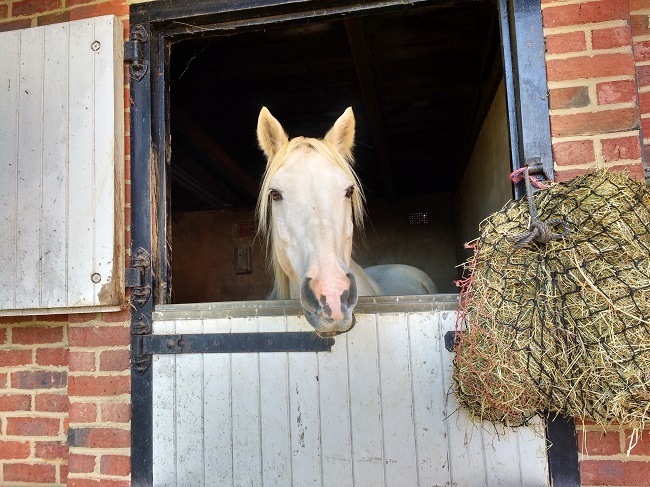 I’d arrived on the yard around 9:30am to see that everyone – our three, and the little Arab mare who also lives there – had broken out of their respective paddocks. My initial thought was that I was going to have a very long morning trying to round everyone up, as Little Mare’s owner was on holiday, Ben was out teaching, and I was in charge of them all. Then I realised that a) part of the solid arena fencing was completely smashed, and b) there was blood on the Little Mare. Rather a lot of blood. We still can’t really figure out what happened. Piecing it together, it would appear that Little Mare ran out through her electric fencing and then went straight up the field and in through our fencing. There was another break on the corner of our track, where someone – or several someones – had broken out again. Then there was another break in, where an unknown number of equines had rushed up the narrow path between the hedge and the piles of rubble (there were also hoofprints over the piles of rubble. We’re trying not to think too much about that). We think that the smashed arena fence was the conclusion to it all. Little Mare was too hurt to move, so I and the yard owners stood with her while we waited for the vet. She and Iris had been in the arena when I arrived, and we thought that Iris’ proximity was stressing her out – but when we tried to take Iris away, it bothered her even more. The boys then made their way into the arena through the broken fencing, and suddenly I had all three of them crowding round. It wasn’t a case of quickly gathering them up and sticking them somewhere, as I had nowhere to put them. Fixing the fencing and then catching everyone would have taken too long and I needed to be with Little Mare. 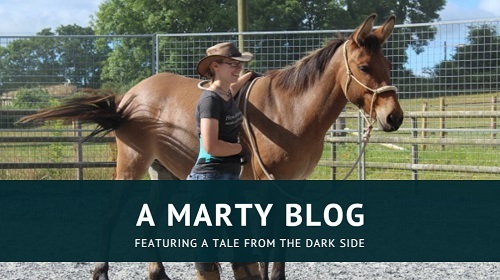 The yard owners were fantastic and I am so grateful for their support, but they are not horsey and so were not able to sort out the herd for me … particularly not when we have Special Cases like Marty and Cash! So I ‘parked’ Iris at a respectable distance, not too far and not too close, and kept an eye on the boys. One at a time, they would come forward and try to go round behind Little Mare; her hind end had taken the most damage, and it was that area she was most protective of. I would step forward, set an energy barrier, and direct them away. I have to say I was more than a little shocked when I did this the first time and it actually worked! Cash just turned around and walked back to the others. Marty in particular was very curious about what was going on and kept trying to walk towards me, but it didn’t take more than a little push of energy to get him to back up. They actually ended up arranging themselves into a perfect line-up like something out of an Emma Masingale video, and they waited like that, quiet and peaceful, until the vet arrived. As soon as he stepped into the arena, they peeled away and ambled out to the field to graze. It felt almost as though they knew that help had finally arrived, and Little Mare did not fuss when they left. 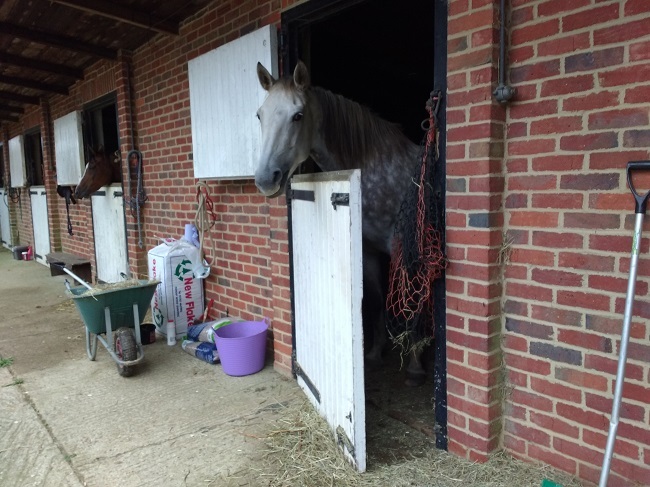 I obviously didn’t take a photo of them lined up in the arena, but here’s another example of excellent training*: I arrived Tuesday evening to find that the door had come open some time during the afternoon, and Iris was still standing in the stable. We haven’t done proper liberty work with any of them, and we definitely haven’t tried to work them as a herd. I didn’t ask them to line up and I certainly don’t believe that they were really under my ‘control’, but I do think that the groundwork we do, and the way we try to work them – by directing, rather than driving – has set a foundation that made an awful situation a lot easier to handle. Although I was too busy to think much on it at the time, it was a really fascinating moment. Little Mare is now on box rest, so Iris and Cash are taking shifts to be stabled next to her and keep her company. This means Marty has to be in the field on his own during change-overs, but he’s been remarkably serene about this! 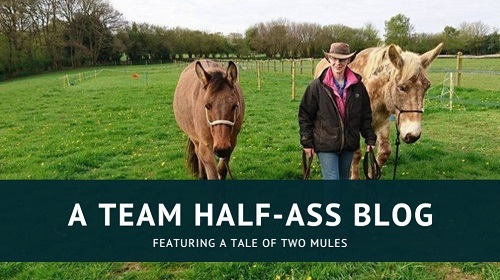 Not at all like the little mule who bust out of his paddock once and tried to hop over the five-bar gate when I brought both horses in to have their feet trimmed, early on in my ownership of him. He is a good mule. Of course, why Little Mare felt that her only choice was to try and jump the very large, very solid arena fencing is the real mystery of the day. 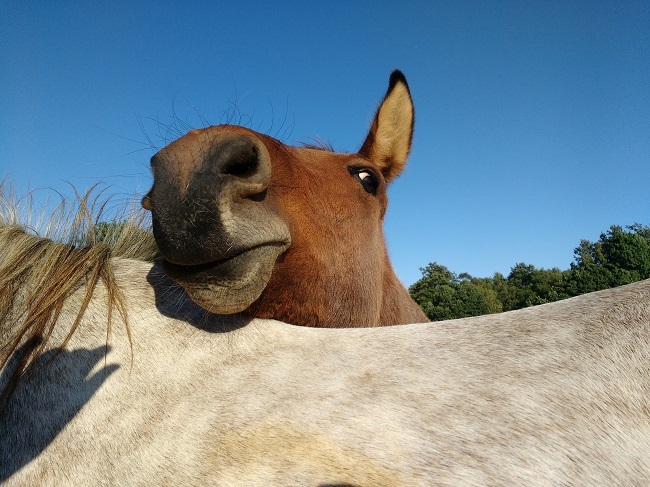 The entire field is about four acres and mostly ungrazed, so there is plenty of space for four equines to move around in – even if they’re feeling a bit silly – and plenty of grass to occupy their attention. They’ve escaped and got in together several times before, in much smaller spaces, and there have never been injuries or boundary fencing jumped. Usually I arrive and everyone’s grazing together peaceably. They must have been absolutely terrified to have broken through live electric fencing four times, in the places that they did, and for Little Mare to have attempted the jump. It chills me to say it, but it seems more and more likely that something was chasing them. But what? Dogs would have barked, and the yard owners heard nothing that night. Besides, although Marty may run from dogs elsewhere, in his field he will stomp anything that trespasses. When the vet arrived, I had to shout to warn him about his little dogs as I could see Marty making a beeline for them! What could have been chasing them that Marty did not try and kill? It reminded me of an odd dream I had earlier this year, in March. The field they are currently in overlooks a hillside with a pond at the bottom, backed by a small area of woodland. This was never a problem – indeed, they used to graze the hillside, and the first walks I ever did with Marty were around the pond – until suddenly, and without explanation, they all became terrified of it. They’re still wary now. In my dream, I was standing with Marty in his field and I asked him what they were afraid of. He showed me two images: a view to the right of the pond, over the trees and into the valley beyond, and a view of the pond itself. Then he said, “Every night it comes down to the water to drink.” I never did figure out what “it” was and although the dream wigged me out, I put it down to an overactive imagination. The latest events have made me question it again! Still the most useless thing I’ve taught him, but it does bring a smile at the end of stressful day.